This play is sometimes called 'Kijin no Omatsu'. It is "...based on a popular tale sung during the early nineteenth century to a street entertainer's music called chongare bushi. The ballad told of how a wandering samurai was taken in by a beautiful female bandit whom she met at Kasamatsu Pass in Echigo, and whose traveling companion he became until, while crossing the Tani River, she stabbed him to death." Quoted from: New Kabuki Encyclopedia, edited by Samuel L. Leiter, p. 589. 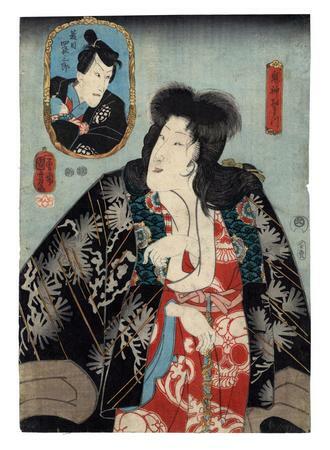 In Beauty and Violence: japanese Prints by Yoshitoshi 1839-1892 it say of the diptych in Philadelphia: "Omatsu... is at the centre of a number of thrilling but quite contradictory stories. In a number of these tales, there are recurring elements: Omatsu disguises herself as a man; she is head of or a member of a gang of highwaymen, she is looking for or in possession of Kishinmaru, a prized sword. Shirōsaburō is her blind samurai husband in one story, while in another her father's murderer." This image commemorates a performance of the play Shinpan koshi no shiranami (新板越白浪 ) performed at the Ichimura theatre in 1851/9. ex B. W. Robinson collection ex C. H. Mitchell collection - skeleton kimono design. "Interestingly, this work has a shita-uri (literally, 'low sale') seal which indicates that it was on a restricted sale (supposedly sold from a pile on the floor) in order to avoid problems with the authorities. Kuniyoshi made several other prints depicting Ōmatsu... of which at least one other also bears a shita-uri seal." Quoted from: Heroes and Ghosts: Japanese Prints by Kuniyoshi 1797-1861, p. 173. It is accompanied with a color reproduction.